Down to 162.4 today...whoo hoooo! hey, l. good to see you. you look terrific in you lovely crocheted top. i'm sure you'll finish losing. 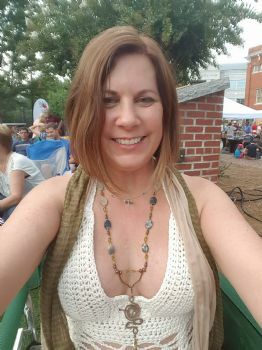 I'm here...I'm trying... :) Here I am in a crocheted top I made for myself last Fall. :) (Kind of my FU to breast cancer). Hugs, ya'll. Glad you had some time to post. I found out I am a comfort eater too. Hi Specialgurl, Glad to see you back. This is motivating to see people posting to motivate others in the group. I haven't been here is a while. My motivation this week is to get back to where I am focused and determined to make lifestyle changes. My motivation right now is to lose 20 more pounds. I had gotten up to 176 (BOO!) because after surgeries, I found I am a "comfort eater". I've got up to 176, have lost down to 162.8 as of today and by May 19th (when I go to the BEACH with my family), I want to be down, if not 20 more, definitely close to that! My motivation is my friends including the ones that I am meeting her. my motivation is to improve my health and be able to be more active physically. have sent one goodie so far. my motivation is my health. all my blood numbers rise with my weight. Since we are getting a late start this week. 1) Reach out to three people on our Sparks Team -Starting Over Weekly Mini- Challenge Team. 2) Share your motivation for this week.